Looking for a local corn maze or hayride in Western Massachusetts? Scroll down this page and you will see the all of thoses in Western Massachusetts, sorted by county. Some are huge corn mazes with hayrides, pumpkins, corn cannons, inflatables and others are simple corn mazes with little else. Most also have loads of pumpkins to choose from. To really make it fun for your kids, look for those that have the extra activities, like a corn cannon, cow train, inflatables, farm animals, pumpkin patch or zip lines. There is usually a small fee for the mazes (of course, the more elaborate mazes tend to charge more. Hayrides are often free. ALWAYS call before you go to confirm the info, they don't always report changes to me! A visitor writes on September 05, 2011: "The maze and farm are in a beautiful location, between forested hills to the north and the Deerfield River to the south. Across the river are more hills. This is a very scenic location at foliage time! The corn for this maze was deliberately planted late, so as of early September the stalks are still green and very tall and robust. There is also a small cemetery on the farm next to the maze, to add a little atmosphere. Not many people know about this maze yet, so it is nicely uncrowded. The operators are very friendly and eager for visitors to have a good time." Mike's Maze - corn maze, Corn mazes (not haunted), Hayrides (not haunted), Pumpkin patch, Pumpkins, restrooms, concession stand (drinks, snacks and/or food), picnic area, birthday parties, group tours. A visitor writes on October 14, 2014: "Found them on your site and had a great time there! Their maze is beautiful and the potato launcher was a ton of fun too." 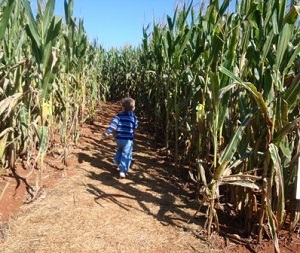 A visitor writes: "This is a great corn maze! There is always a game involved when in the maze, fun for the whole family. Pumpkins are given as a prize for completing the game and can also be purchased. There is also a potato gun that can be shot and a small snack bar.. "
55 Alvord Street, South Hadley, MA. Phone: 413-533-3714. 1st left off Route 47 from center of South Hadley. Farm is 2 miles on right. Open daily, call for times and picking conditions. Hayrides to the pumpkin patch. Homemade ice cream, cornstalks, hay bales. At The Clarion Hotel & Conference Center, One Atwood Drive, Northampton, MA 01060. Phone: 413-586-1211. Directions: see the hotel's website or : From the Mass Pike (I-90)/East or West: Take exit 4 to connect to I-91 North to exit 18. At the bottom of the ramp, turn right. Turn right onto Atwood Drive . The Clarion Hotel & Conference Center is located on your right. And for a Google Map, click here. Open: Held every weekend in October, Friday, Saturday and Sunday nights: 7 pm to 11:30 pm; Saturday and Sunday Matinees: 12 pm to 4:30 pm. Shows start every 15 minutes and last about 30 minutes. Discover Halloween as you've never done before. Experience an innovative attraction with 11 fully automated sets, hand crafted props, unique character animatronics, and two different endings to choose from. Because you’re not just watching the show-- You're in it. Skeleton Crew Theater, the “intelligent” haunted house, plays out as part scavenger hunt and part theater. Unlike other Halloween attractions, SCT fabricates all works by hand--nothing is store bought. All props, puppets, costumes, score, sets and stories are original. The show has no recognizable Hollywood characters, maintains a general absence of clichéd gore, and tailors each show to the philosophy of “The Hero’s Journey,” the classic mythical story structure that has aided George Lucas’s Star Wars Trilogy & J.K. Rowling’s Harry Potter Series. Small groups, accompanied by a masked, silent guide, are lead through several interconnecting sets. Along the way, SCT participants interact with elaborate puppet characters, collect clues & ultimately decide their own final.